Are sunspots ruining your skin? If yes, then we have the solution for you, Read on to know how do you get rid of sunspots on face and skin. So before we move on to how to get rid of sunspots let’s try to understand what are sunspots? Sunspots can occur on any part of your body which is regularly exposed to sun, most often they appear on your nose, cheeks, upper lip, ears, forehead, neck, arms, back of your hands. These spots can be darker or lighter than your normal skin tone and can occur in different shapes and colors. These spots might look like raised warts and may also itch a little. Some sunspots look like scaly or rough skin lesion, some spots can be flat as well. Do not mistaken between Freckles and Sunspots as they may look similar but are completely two different things. The sunspots can occur at any age and are completely harmless. These spots are caused by overexposure of your skin to the sun. What Causes sunspots on the skin? Sunspots also known as solar lentingines in medical terms, are caused by overexposure to the sun’s harmful ultraviolet rays. People with lighter skin generally are more prone to get sunspots. Sun allergies are another reason which can cause sunspots on skin. Excess production of melanin also can cause some patches of your skin to have darker patches which are similar to sunspots. Sun bathing is one of the factor responsible for sunspots on skin. Increased exposure to sun leads to sun spots on skin, which can make you look older. Now that we know what causes sunspots, let’s look at how we can get rid of sunspots. Prevention is better than cure they say, so let’s look at how we can prevent sunspots on the skin. (i) Apply sunscreen Lotions: To protect your skin from the sun’s harmful UVA and UVB rays you can apply a broad spectrum sunscreen with an SPF of at least 15 every day, fifteen minutes before you go out in the sun. If you are heading out during time of the day when the sun rays are very harsh on your skin make sure to use a sunscreen with an SPF of 30. Always buy a good quality sun block which has a high SPF level to protect your skin from sun damage. (ii) If you travel in a car too much then you should consider getting an anti-UVB coating installed on your car’s windows to protect you from the sun’s UVB rays. (iii) Tanning booths are one of the main causes of sunspots and sun burns, so as much as possible try to avoid them. You didn’ take the precaution and now you got sunspots. Don’t you worry read on to know some of the best natural home remedies to get rid of sunspots naturally. These Natural Home Remedies are sure to get rid of skin sunspots and get your glowing skin back. 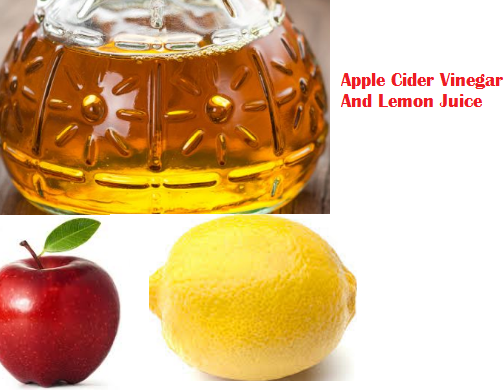 (i) Apple Cider Vinegar And Lemon Juice To Lighten Sun And Age Spots: Apple Cider Vinegar (ACV) is a natural astringent and contains natural alpha hydroxyl acids, which are known to have the property to lighten sun and age spots. Lemon juice is loaded with citric acid which helps to lighten darkened areas of the skin. To get rid of the sunspots just mix about 1/2 teaspoon of apple cider vinegar with 1/2 teaspoon of lemon juice. Dip a cotton ball in this mixture and apply it evenly on the sunspot affected areas of the skin. At first you may feel a little redness or some stinging but it’s completely normal. If your skin is sensitive to the mixture you can dilute it using a little water. Let this mixture sit on the affected area overnight and rinse it in the morning to get amazing results. Applying this mixture makes your skin more sensitive to sun exposure, so don’t forget to wear sunscreen every time you head out. Apply this remedy for at least six weeks to see its effects. (ii) Lemon Juice to remove sunspots: Lemons are loaded with citric acid which helps in lightening the dark sunspots, it also helps in getting rid of dead skin cells and regeneration of new skin cells. You just need to lightly rub fresh lemon slice or even lemon juice directly on the skin that is affected, a thrice a day. After you rub it, Let the lemon juice be there on the skin for about 20 minutes, then rinse it off using cool water. Note that applying lemon juice makes your skin extra sensitive to the sun, so avoid going in the sun with lemon juice applied on your skin, Also after you do this remedy make sure you always wear a sunscreen when you’re going out in sun. People with dry skin are recommended to use a moisturizer after this treatment as this can make your skin feel drier. Caution: Lemon juice may cause irritation to the skin of people with very sensitive skin, so if you have sensitive skin, dilute the lemon juice with some water, rose water or honey. An alternative to the above home remedy is to mix sugar with lemon juice to make a paste. Use this sugar, lemon paste as a scrub to treat sunspots. Apply this scrub on the affected areas. Let it sit on your skin for about 5 to 10 minutes, and then rinse it off. Do this a few times a week to see amazing results. People with dry skin should add in some olive oil in this scrub to provide moisture to the skin. (iii) Aloe Vera to prevent sun damage to skin: Applying Aloe Vera gel is an amazing way to protect your skin from sun damage and it also works to reduce inflammation due to its anti-inflammatory properties. To get rid of sunburn you can apply Aloe vera gel directly on the sunspots or the sunburned area. The anti-inflammatory properties present in Aloe vera, works to reduce the redness and swelling brought on by overexposure to harmful UV rays and also soothes the skin. It also acts as a protective layer on the skin for retaining moisture. Aloe vera being loaded with antioxidants and nutritional properties, the skin is able to retain the moisture and heals the sunburn quickly. Apply aloe vera on your affected skin daily for at least two months to make sunspots on your skin to slowly and effectively fade away. 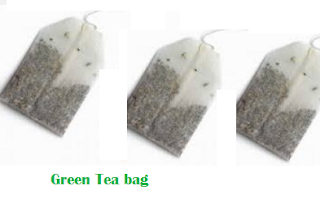 (iv) Green Tea bag: Green tea is loaded with anti-oxidants, which help in healing skin quickly from damage caused by the UV rays of the sun. To treat sunspots using green tea, you just need to soak a green tea bag in boiling water for some time, then squeeze the tea bag onto a cotton ball. Rub this damp cotton ball on the areas of the skin affected by sunspots at least two times a day. (v) Milk or Butter Milk: If you have sunspots on the face, Then try applying some milk, let it sit there for about 15 minutes, and then rinse your face. The lactic acid present in Milk helps in lightening skin and regenerating skin cells. 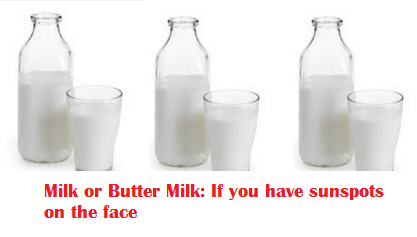 You can also use buttermilk instead of milk to remove sun spots on face. Other professional treatments for getting rid of sunspots: Even after using all these wonderful natural home remedies, you are still not able to get rid of sunspots then you should go visit your dermatologist. Skin sun spots are said to be harmless and non cancerous, but it’s still best to get an opinion of a skin specialist on the same. There are a lot of sun skin spot treatment options available, the ones which we have mentioned above are an all natural treatment for sunspots on skin. Other treatments for sunspots include over-the-counter drugs, chemical peels, dermatological procedures, like laser therapy, cryotherapy, freezing, dermabrasion, etc. For example, laser therapy works to destroy the cells that generate extra pigment, in cryotherapy, or freezing, it destroys the extra pigment itself. Dermabrasion and chemical peels both work to destroy the top layer of the skin damaged by sun, so that a fresh new layer is of skin is regenerated. The dermatologist will have to diagnose you to suggest which of these treatments would work the best for you. These professional skin treatments are very costly. You can also consider over-the-counter products which can be used topically to get rid of skin sunspots. So now that you know what are sunspots, how to prevent them and how to treat them, you are ready to go out in the sun and have some fun.